20 Knots: Daffodils for Boston elevates the symbolism behind the daffodil – a flower that not only serves as an expression of springtime, new beginnings, and hope, but one that has also become synonymous with the Boston Marathon and Boston Strong thanks to the ongoing work of Marathon Daffodils. Now in its seventh year, Marathon Daffodils, founded by Diane Valle in response to the tragic marathon bombing, mobilizes a network of nonprofits and horticulturists to place 130,000 daffodils along the 26.2 mile marathon route. 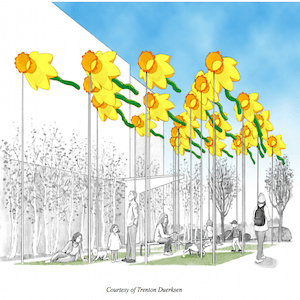 Seaport has partnered with Marathon Daffodils for the second year in a row to place daffodils in businesses’ and restaurants’ windows across the District. This exhibit is just one of many public art installations that have been featured in this neighborhood!